If you think running is tough, try dancing, says Robert Herjavec, an entrepreneur and investor on ABC’s Shark Tank. He’s taking on a new challenge outside the tank now that he recently signed on for the upcoming season of Dancing with the Stars. An “off and on” runner his whole life, Herjavec says he started taking the sport seriously six years ago. He ran the New York City and Miami marathons–he finished Miami in 4:40–and now, he notches daily five-mile runs capped off with an eight- to 10-miler on the weekends. 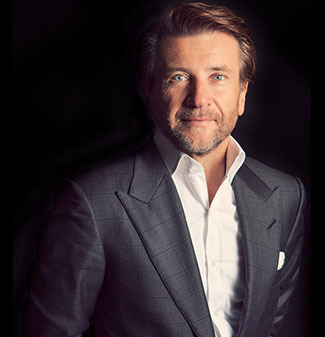 Recently, Herjavec has been trading his running shoes for ones fit for a ballroom. But before Dancing with the Stars filming began, he ramped up his running in preparation for the show. So far, rehearsals with partner Kym Johnson have left him more sore than tired. Herjavec says focusing on difficult tasks like dancing and running have tamed his “hyper” side when it comes to his business practices, too. “Business is a sprint because you have to go until you find an opportunity. Then you need the patience of a marathoner,” he said. “That’s the one thing I’ve really learned from running. You can’t rush the miles. No matter how fast I run, the five miles isn’t going to be done in the first five minutes. Despite his hectic schedule, Herjavec almost always manages to find the time to run every day, blocking off a couple hours each day to explore Miami’s boardwalk or the coastlines in his birthplace Croatia on foot. The treadmill isn’t his enemy either. No matter where he’s running, Herjavec keeps lacing up because after every run, “I always feel such a sense of accomplishment. I don’t get that from the elliptical or doing weights. Watch Herjavec on the season premiere of ABC’s Dancing with the Stars on March 16. Originally posted on Entertainment Weekly on March 24 2015.